this new update that isn't an update i hate you valve...but can we find a better word than apple to rhyme with grapple? Re: Anything else rhyme with grapple? EDIT: My distaste is for VALVe's conduct regarding TF2 and the Mac, not to this thread nor its OP. I mean, come on, we wait 10 years and they are like "BIG UPDATE" and it's nothing. Well this isn't a big suprise, I find the upcomming E3 suprise bigger (new Half-Life anyone?). Anyway it's a good idea from Valve, not a lot of compagnies create games for Mac so with a sharing platform like Steam they can really conquer the Mac gaming. The only question that remains is who wants to game on a Mac and doesn't has a dual boot setup at the moment? 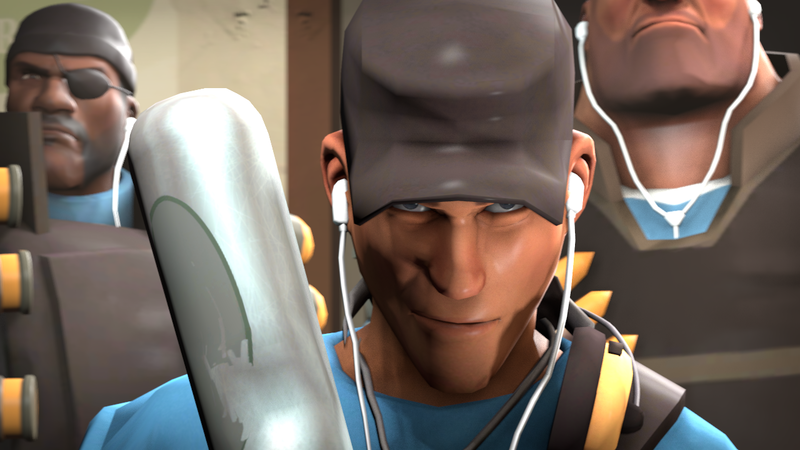 Also, I want a hat based on this: http://www.teamfortress.com/images/posts/tomorrow_large.png. Would be cool if Valve gave a special Mac hat to everyone that plays TF2 on a mac (and one for PC). Wtf , when will engie update come. Google wrote: Wtf , when will engie update come. I love their iphone earphone. Implying that there is more than one thing. Nicobbq wrote: After the Mac Update. Valve time. Hours mean days, days mean weeks, weeks mean years. coward that hides behind his sentry update'll come with HL2 EP3. Edit: oooh, someone interchanged E n g i n e e r with "coward that hides behind his sentry"
The Mad Hatter wrote: Valve time. Hours mean days, days mean weeks, weeks mean years. coward that hides behind his sentry update'll come with HL2 EP3. There's a chart somewhere using past valve time episodes to give an accurate representation of how it works. Lemme find it. There you go. Tomorrow=Later this week. omg that chart is hilarious lmao! This finally mean I won't have to boot camp my way into windows to play tf2 anymore! Hoboapple wrote: This finally mean I won't have to boot camp my way into windows to play tf2 anymore! THEY'RE GOING TO MAKE THE coward that hides behind his sentry BUILDINGS UNDERPOWERED BUT THEY'LL LOOK SO COOL!